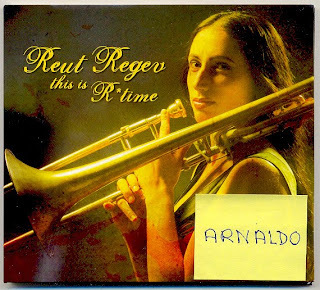 Jazz Station - Arnaldo DeSouteiro's Blog (Jazz, Bossa & Beyond): CD of the Week - "Reut Regev: This is R Time"
CD of the Week - "Reut Regev: This is R Time"
The stunning debut solo album by the superb NY-based Israeli trombonist Reut Regev. All tracks are originals by Reut herself, a couple of them co-written by her drummer & husband, Igal Foni, who wrote alone "Nutcase Scenario." Other musicians on Regev's keyboardless group are David Phelps (guitars) and Brad Jones (acoustic & electric bass), plus special guest percussionist Eddie Bobé. Besides the slide trombone, the leader also plays flugabone and percussion. You'll not believe in your ears! Contemporary-progressive jazz of the highest caliber. Btw, she was also elected "Best New Discovery of 2009" (according to Troy Collins' Best of 2009, AllAboutJazz) and "Best Debut of 2009" by jazz historian David R. Adler on his "Top 25 of 2009" list. 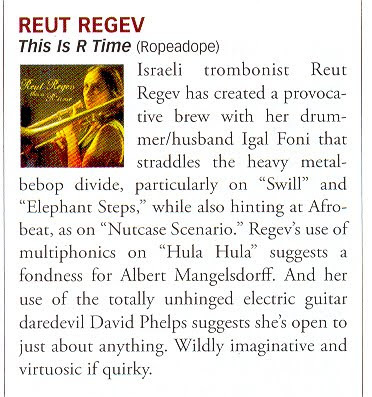 And here's what JazzTimes magazine (December 2009 issue) wrote about "This Is R Time," which, btw, just got another rave review this week, in the January 2010 issue of Cadence magazine. Claus Ogerman wins GRAMMY as Best Arranger! Obama: "You have to see this"
Gina Saputo live @ Steamers tonite! New jazz film: "They Died Before 40"
Free download of Alan Hewitt's "Shaft"
Single of the Day - "Agnes: I Need You Now"
Obama: "State of the Union"
CD of the Week - "Ralph Lalama: The Audience"
CD-Single of the Day: "Paul V. Presents Giglian"
CD of the Day - "Street Angels"
Vinyl of the Day - "Street Angels"
Obama: "What's next in 2010?" CD of the Day - "Moraine: Manifest Density"
Models in Scottsdale, AZ area! DVD of the Day - "CTI All Stars: Live in Spain"
CD of the Day - "CTI All Stars: Live in Seattle"